Mix the beans, onion, peppers, and tomatoes in a bowl with 1 tbsp. of olive oil and lemon juice. Add garlic for added flavor. Brush the fish with lime oil and place on grill. 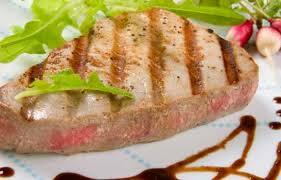 Mix salad with parsley and mint then serve with tuna once cooked.